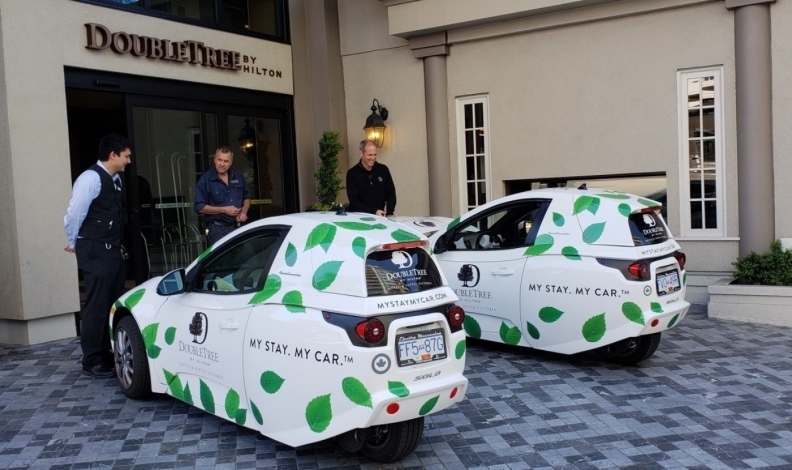 DoubleTree by Hilton has added the single-seat, three-wheel commuter EV to the My Stay My Car program for its Hilton Hotel & Suites property in the B.C. capital. VANCOUVER — Electric-vehicle start-up Electra Meccanica has announced a tie-in with a Victoria hotel that will make its Solo cars available to guests at a small extra charge. DoubleTree by Hilton has added the single-seat, three-wheel commuter EV to the My Stay My Car program for its Hilton Hotel & Suites property in the B.C. capital. Beginning immediately, guests can rent a Solo for $20 per night, including parking. The program, which also offers Toyota Prius, is provided via Turo, a car-sharing rental service. "With so many travellers arriving to Victoria's Inner Harbour on foot via float plane or ferry, we're thrilled our hotel is able to offer them this easy, cost-effective and green way to explore our city,” Francis Mairet, principal of Mairet Hotels, which manages the property, said in a release. The arrangement exposes the Solo to more potential customers as it moves towards volume production. The car, with 160-kilometre range and a $20,000 asking price, is built in small numbers at Electra Meccanica’s Vancouver facility but production at a Chinese plant is slated for later this year. The Solo was recently certified for U.S. sale and can be sold in B.C. but still lacks wider Canadian certification.